Above is a photo of my 5 feet by 10 feet genealogy wall chart, 12 years in the making! 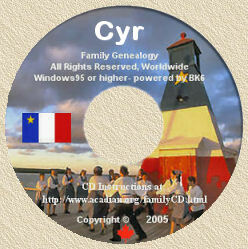 It is printed on canvas, includes 4 families, 36 generations, 714 names and is dedicated to my favourite uncle, Roch Cyr, who got me hooked on this wonderful genealogy hobby. Uncle Roch passed away in 1999 and is now with his ancestors... "digging for his roots" ! For those who might be interested, the chart was prepared for me by KHandA Printing, 355 Elmira Road, Unit 121, Guelph, Ontario, Canada N1K 1S5 Telephone 519-822-1594, fax 519-822-1846, or toll-free at 1-877-744-4144. They can also be contacted via e-mail at [email protected] I have absolute no hesitation in recommending them as... the best!